In a few miles of this forest there must be more ants than there are men in the whole world! This seemed to Holroyd a perfectly new idea. In a few thousand years men had emerged from barbarism to a stage of civilisation that made them feel lords of the future and masters of the earth! But what was to prevent the ants evolving also? Such ants as one knew lived in little communities of a few thousand individuals, made no concerted efforts against the greater world. But they had a language, they had an intelligence! Why should things stop at that any more than men had stopped at the barbaric stage? Suppose presently the ants began to store knowledge, just as men had done by means of books and records, use weapons, form great empires, sustain a planned and organised war? Sometimes an ant is more than just an ant. University of Kent senior lecturer in the history of science Dr. Charlotte Sleigh has been known as "the ant woman" for her research into the way that society has shaped the way scientists have looked at ants. In her 2003 book Ant she discusses how ants came to represent "Europeans' fears about the complicity of savage insects and humans" and how that was "part of a larger anxiety about "degeneration". This has been well documented by historians; predictions that the sun was going to die, that hte comforts of civilization would cause evolution to run backwards, that the working classes were out-breeding the rest, and that the white man could not survive the tropics all contributed to the sense that things were going downhill around the turn of the twentieth century. Although they are large as ants go, they are still too small to be shot, and little enough to swarm and surge like Ewers' black carpet. The ants also seem to have evolved greater intelligence than normal. The Portuguese captain turns out to be incompetent; he sends the lieutenant to his death on an infested ship of human corpses. He futilely fires his cannon at the ants' ranks - ranks that simply scatter and recondense like so many droplets of black water. No wonder, then, that the mission fails. The ship turns around and sails away with all haste, leaving the ants to their new-found mastery of the continent. What gives the story its bite is its title. The tale goes beyond the fantastic and taps into contemporary fears about the tenability of European empires. Wells could not resist pushing anxieties about the limits of progress and the fragility of European superiority to their furthest extreme. That brought to mind another ant short story, Carl Stephenson's "Leiningen Versus the Ants", originally published in Esquire in 1938. The story is about a "scrappy, no-nonsense" settler in the Brazilian wilderness who battles to save his plantation from being overrun by ants. Even though he's the hero, when I read the story I ended up quite disliking Leiningen (who is racist, sexist, and arrogant) and was rooting for the ants to win. But, alas, he does. Apparently Europeans can conquer the savage wilderness if he is of strong enough character and willing to do anything to succeed. Read "Leiningen Versus the Ants" at Classic Short Stories. May I suggest the story Doomsday Deferred by Will F. Jenkins, better known to SF readers as Murray Leinster? I first read it as a child in Alfred Hitchock's Monster Museum, a surprisingly good anthology -- it still holds up for me as an adult reader. "Doomsday Deferred" has an interesting publication history that shows how the story straddled the line between "mainstream" and "genre" fiction. It was originally published in the Saturday Evening Post in 1949, which was about as mainstream in American culture as a magazine could be. 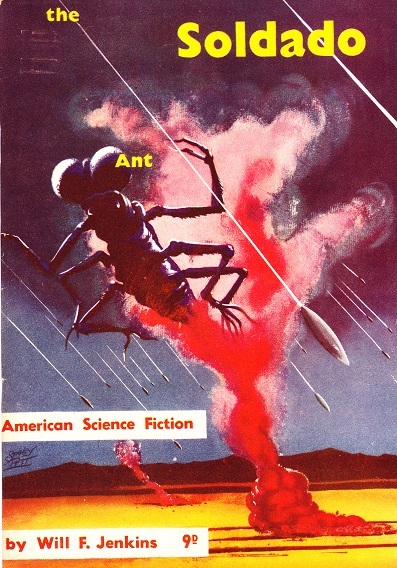 It was also reprinted as a booklet in Australia under the American Science Fiction imprint as "The Soldado Ant". It sported a very B-movie-ish ant battle scene on its cover. It's been widely reprinted elsewhere in both horror and science fiction anthologies. Now I feel like I need to go out and find a copy! That straddling of mainstream and genre fiction is typical of Monster Museum. It has storied from Stephen Vincent Benet and Theodor Sturgeon, among others. And while the stories in it were published in both mainstream and genre publications, the overall quality and tone are very consistent. It's one of my favorites. Highly recommended. And, well, you know. Monsters! CC: According to Wikipedia, Les Fourmis was translated into English and sold as Empire of the Ants. That's a bit confusing! Sounds like a cool novel, though. (Empire of the Ants by Bernard Werber @ Wikipedia). Sean: It sounds like an entertaining collection. I'll keep an eye out for Monster Museum next time I'm browsing the used book store. I thought for sure you'd also mention Bernard Weber's Empire of the Ants when I first read the blog title. I hadn't known H.G. Wells had also written a novel by that title. 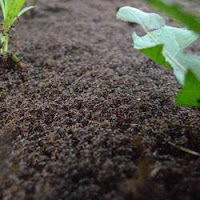 Weber's Empire has been criticized because the "supercolony" of ants he describes, come with replete workers, farmers, door-keepers, formic acid sprayers and army-ant-like behavior, doesn't exist in any one species, his "russet ant". I, personally, took his rolling up all those species into one as a way of simultaneously looking all the different kinds of adaptation tactics ants use. It was a rather good book, even when combined with the somewhat asinine human characters (really, locking yourself in a basement with ants isn't really the best idea when the ants can "think" and your entire system of nourishment is dependent on them) and had two (maybe three) storylines going at once. In a way, it was a very interesting "first contact"-type story. See more here (I used TinyURL to shorten the links, don't fear any spam *wink*). http://thenostalgialeague.com/cr/von-mohl-vs-the-ants.html - in this comic, ants won. By the way, thank you. You have shown me the world of "ant-fighting" fiction, and I am grateful for that 8-).